This easy recipe for seared salmon with blue cheese topping is proof that preparing seafood does not need to be complicated. Try this simple one-skillet recipe once and I guarantee, it will become a go-to fish dinner soon! 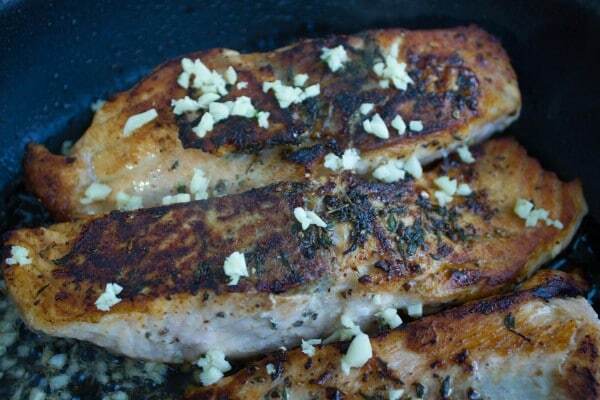 This seared salmon with blue cheese recipe is one you will make over and over again. Delicately seared fresh salmon fillets with brown sugar, garlic and thin lemon slices topped with creamy blue cheese when done. A show stopper at your next party or a perfect dinner ready in 15 minutes! A salmon lovers’ dream. …and the list goes on. Well, I find that seafood is just the opposite of all of the above! Seafood happens to cook really easy and really fast, be it on the stove, roasted, broiled, steamed, poached, fried, you name it. My favourite ways would be roasted, broiled or seared. 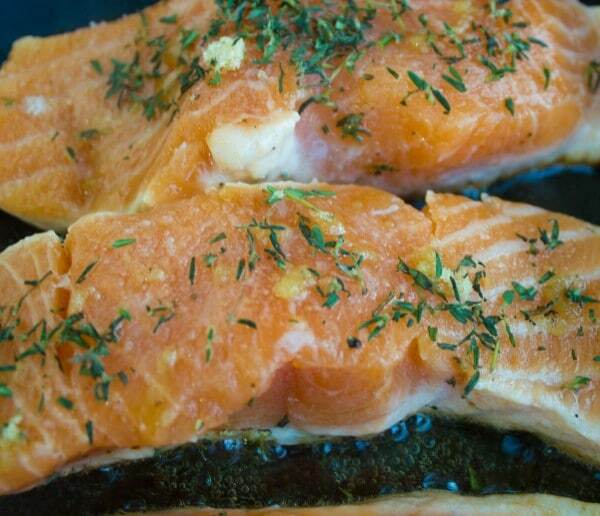 This amazing recipe for seared salmon comes together in 15 minutes. It was the first time I have tried out the combination of blue cheese because it was what I had in my fridge at the time, and I found the flavors to be perfectly complimented! Not too strong as you might expect, but rather each strong flavor is made smoother by the other. The addition of brown sugar to season the fillets before searing not only balances out the blue cheese but also helps the fish get this perfectly golden crust which contrasts the soft interior of the fillet. Over medium-high heat, preheat a nonstick skillet or cast-iron pan and add the olive oil. Season the salmon fillets on both sides with salt, pepper and brown sugar. Once the skillet is ready, place the salmon fillets and lower the heat to medium, and allow the salmon to sear on each side for about 2 minutes dropping the heat to medium-low after the first minute. Once the fillets are seared until nice and golden, the garlic is added along with thin lemon slices and sautéed for just a minute to infuse flavor. At that point, the skillet is covered for 2 minutes until the fish is perfectly cooked through. 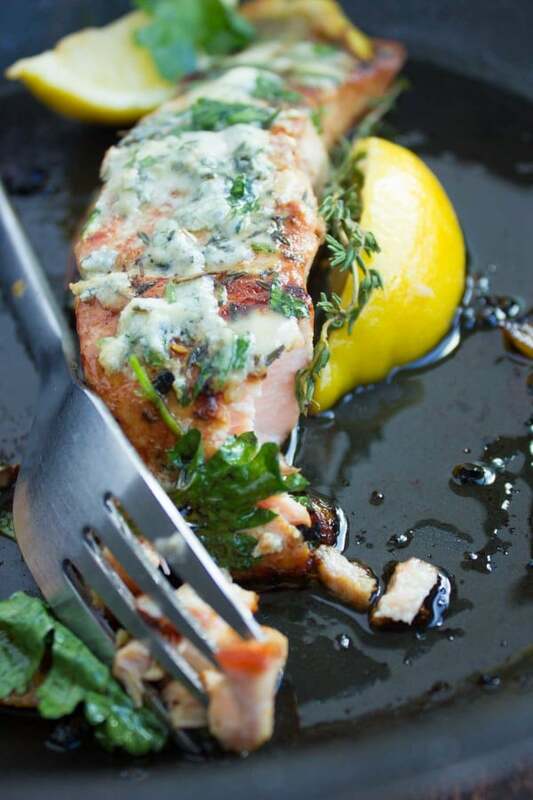 Finally, while off the heat the blue cheese is crumbled on top of each fillet and covered for just 30 seconds to soften up and stick to the salmon. If you prefer the cheese to melt completely, keep the fillets covered for a full minute. A sprinkle of parsley and a soft thin drizzle of honey marks the final touch to this fabulous seafood dish! Enjoy. When frying the salmon, don’t be tempted to turn up the heat or your salmon will be overcooked on the outside and raw on the inside. Trust me, the cheese will melt on top of the salmon, even though the heat is turned off. Use maple syrup instead of honey or coconut sugar instead of brown sugar, if desired. 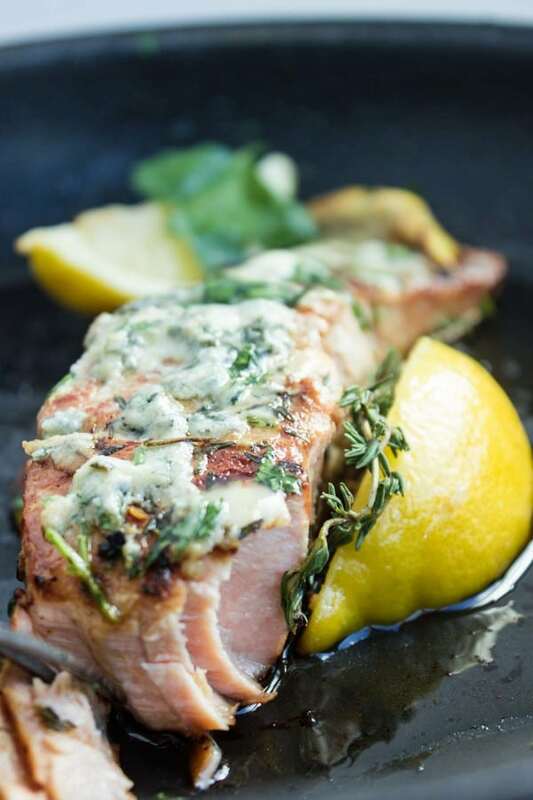 This easy recipe for seared salmon with blue cheese topping is proof that preparing seafood does not need to be complicated. Try this recipe once and I guarantee, it will become a go-to fish dinner soon! Over medium-high heat, preheat a non-stick skillet or cast-iron pan and add the olive oil. Season the salmon fillets on both sides with salt, pepper and brown sugar. Add the garlic and lemon slices and sauté them with the salmon fillets for 1 minute until the flavors burst out, then cover your skillet with a lid (or use aluminum foil if you don't have a lid for that skillet or pan) while maintaining the heat at medium-low. 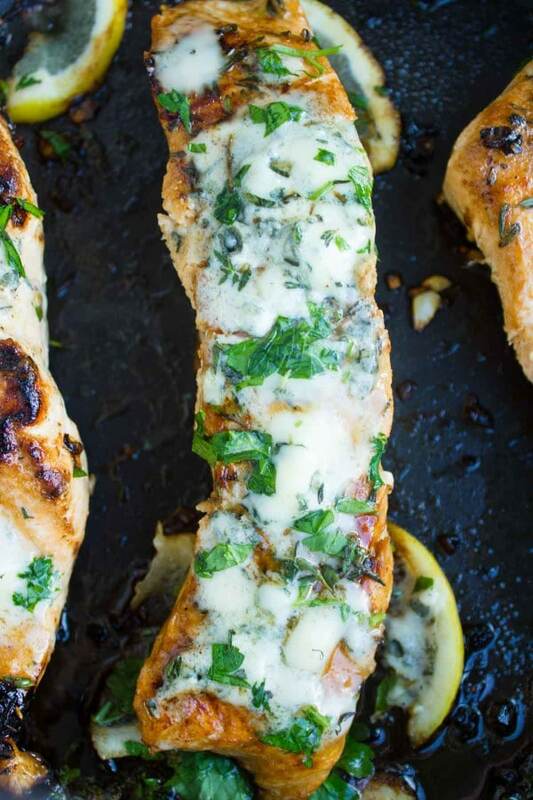 Uncover the skillet, turn off the heat and crumble the blue cheese on top of each fillet and cover them again for a just a few seconds to soften the cheese a little bit. Sprinkle the salmon with parsley and drizzle about 1/4 teaspoon of honey on each. When frying the salmon, don't be tempted to turn up the heat or your salmon will be overcooked on the outside and raw on the inside. This looks so delicious! I would have never thought to combine blue cheese with salmon, but it sounds fabulous. 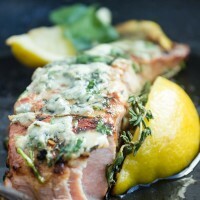 I’m always looking for different ways to cook salmon and I can’t wait to give this a try. Thanks Kim, I hope you try it out soon and let me know how you enjoy it! I agree with Thalia. I had never thought of putting blue cheese on salmon, but it sounds so good. I bet the flavors compliment each other nicely. I can’t wait to try this. Definitely pinning now to make later! Thanks Theresa, hope you try it our soon–you will be pleasantly surprised! 🙂 Let me know ! Thanks Thalia, you will be surprised how well they go together! Thanks Kristen, hope you give it a try soon! OMG! How many ways can you say delicious. I tried the seared salmon recipe and LOVED IT! I like to make salmon and look at different ways to make it. I too would have never thought to pair blue cheese with salmon. When I made it this past weekend, I didn’t have blue cheese so improvised with feta cheese and it was still good; I will hunt for blue cheese next time. The combination of garlic and lemon was superb and very tasty. My family thoroughly enjoyed it. Thank you, Mahy for this recipe :-). I look forward to trying your other recipes. Onto the burgers next. Incredibly delicious! My taste buds were over the moon, the blue cheese on top just made it 200% perfect! Followed this recipe exactly and oh my… YUM!! I love bleu cheese but have never thought of it going well with salmon. The honey adds a nice sweetness, too! This is my go-to for salmon, I’ve made it many times and LOVE it! Wondering what you would recommend serving with it? We have company coming over and I was thinking about serving coconut rice with broccoli but wasn’t sure if all the flavors would come together – thoughts? Thanks Amy!! So glad you love this as much as we do!! My favorite ways to serve this is with pasta ( either a simple butter pasta, or pasta tossed with garlic, lemon zest, olive oil and Parmesan), or with some crusty bread and salad. I love the idea of rice and broccoli with it–I think it would go great! Happy New year!